The Nord Stage 3 is the fifth iteration of the Stage series pianos, a continuance of Nord’s vision of producing the ultimate instrument for the performing musician. The Stage 3 features Nord’s latest technologies including the Nord Lead A1 Synth Engine with sample playback, the Nord C2D organ, an enhanced Piano Section and extensive hands-on Effects. 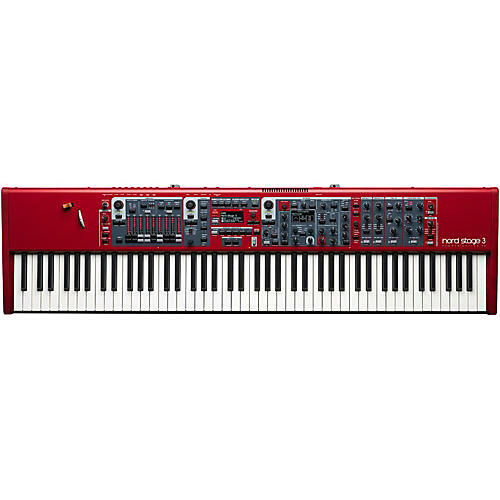 The Nord Stage 3 comes in three models, which differ only in terms of their keybed and playing action. This is the Nord Stage 3 Compact with Nord's top-of-the-line fully weighted hammer action piano keys. Key range A-C.
OLED-displays for Program and Synth section, seamless transitions when changing programs, extended Split functionality with optional Crossfade, song List Mode, and extended Morph Destinations. Doubled memory (2GB) for the Nord Piano Library, greatly expanded polyphony (120 voices), creative Filter presets, and a layer category. Nord Lead A1 Synth Engine with Sample playback, dedicated OLED display for Oscillator functions, expanded Memory (480 MB) for the Nord Sample Library, extended Polyphony, Super Wave category (S-wave). Nord C2D Organ Engine, two new Principal Pipe Organ models. Model 122 Vintage Rotary Speaker - available per Slot, Physical Drawbars for Nord Stage 3 Compact. Improved Delay with added Feedback filters and Analog Mode, Filter Mode with Resonance, separate Compressor per Slot with Amount and Fast mode, and separate Reverb per Slot with Bright mode. And then, of course, there are the attributes that have made the Nord Stage series among the most popular keyboard instruments on the planet. The Stage 3’s sound architecture reflects the chief design precepts of its predecessors in that it is divided into three tone-generating areas, the Piano Section, the Organ Section and the Synth Section. The Nord Stage 3 features the award-winning C2D Organ simulations of B3 Tonewheel and Vintage Transistor Organs plus two brand new Principal Pipe Organs. Two different Organ models can be used simultaneously and the updated vintage 122 Rotary Speaker simulation is also available for each slot independently. The Organ section also features impeccable simulations of 1960’s Transistor Organs, Vox Continental and Farfisa Compact with all of the classic settings. The Nord Stage 3 Synth section features the acclaimed Nord Lead A1 Synth Engine combined with Sample Playback and a brilliant OLED display for all Oscillator functions. The Lead A1 Synth Engine is renowned for its analog-modeling warmth, and uses Smart Oscillator Configurations to deliver stunning results with little programming. There are Single oscillator setups including Pitch and Shape modes, and Dual oscillator setups including Detune, Sync, Waveform, Bell and Noise Mix modes, FM and Ring Mod. The Synth section also provides 3 Unison modes, without reducing voice polyphony. The Nord Stage 3's new Oscillator section features 5 oscillator categories: Classic, Wave, Formant, Sample and brand new Super Wave (S-wave). Enhancing all of these tones is the Nord 3’s expanded Effects Section. The Nord Stage 3 Effect section features a brand new Filter Effect, extended morphable parameters, an enhanced Delay effect and a separate Reverb and Compressor for each slot.